After attending SHOT for ten years, few things seem truly new to me. Everything seems like a variation on a theme – with occasional bouts of clever design – and I rarely see something that makes me stop and wonder about the future. That wasn’t the case at the Radetec booth. There, I saw an assortment of smart guns and smart Slickgun accessories. Some were cool and useful, like a pistol round counter that tracked lifetime use for maintenance purposes. 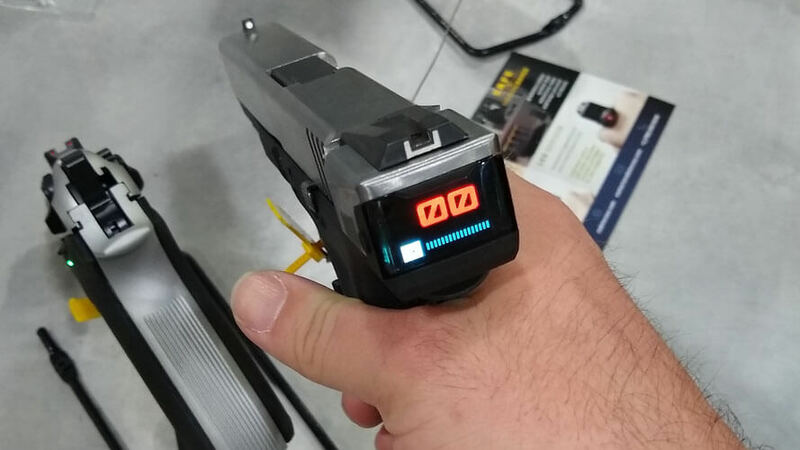 Some were straight up sci-fi, like the Glock with a “smart slide” featuring a digital display in place of a striker cover plate. It displays the number of rounds remaining in a magazine. Their “smart range” concept, though, really threw me for a loop, because they could demonstrate that it worked, and because I immediately thought up some variations they didn’t have on display. 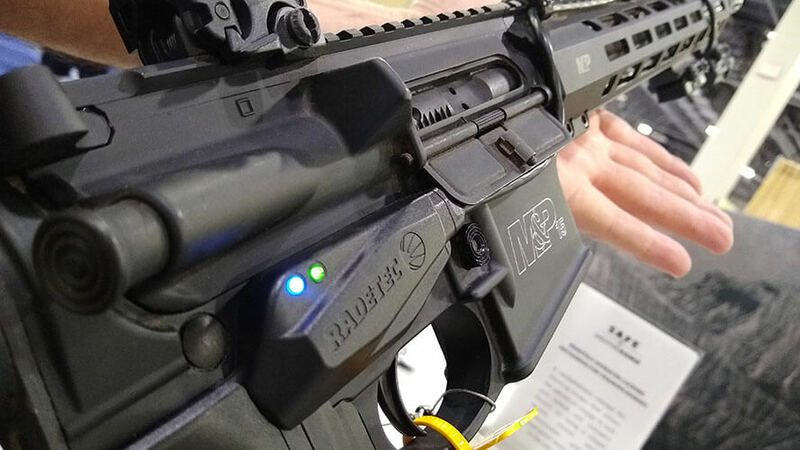 First, their design includes a receiver on the weapon – they had a standard Glock and a standard AR on display with their system – and a receiver downrange. I’m going with “receiver” here in lieu of a more appropriate term, as when I spoke to their rep, language was a barrier to communication and I didn’t fully understand the technical details, just the fact that it appeared to work. Basically, the rifle and the pistol would only function if they were pointed within an arc downrange – not only left and right but also up and down. 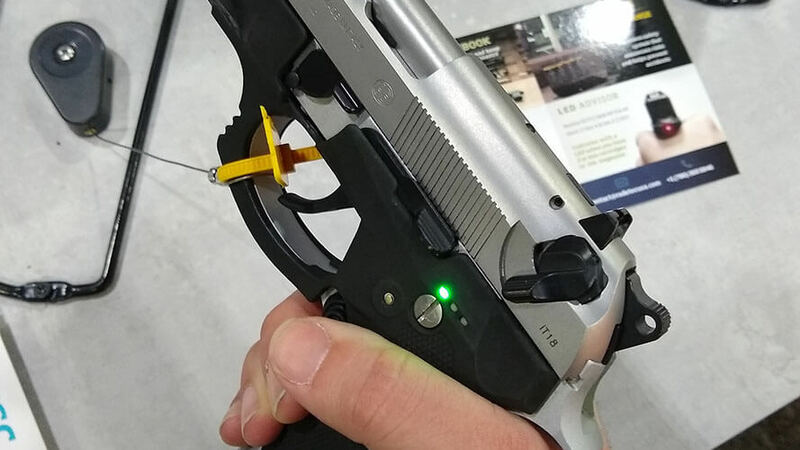 Point the muzzle outside that arc and the LED would go from red to green. You could pull the trigger, but nothing would happen. I tried their Glock and it dry fired properly when pointed at the target, but when aimed outside the arc a beep and brief whirring noise from the pistol-mounted device was barely audible, after which the dry firing clearly did not release the striker. Their system also allowed for remote control of the firearms. Using a tablet or a phone, the range operator can shut down individual guns or the entire line at once. RSOs everywhere would certainly rejoice at the thought of being able to immediately command a cease-fire across a line of 25 shooters. This all seems fairly straightforward, but I immediately thought of some different applications. Instead of the Slickgun being activated when it was pointed within an arc around the receiver, how about it being deactivated when pointed at the receiver? That is to say, what if every police officer had on their uniform, next to their body worn camera, a small device which could immediately deactivate any properly equipped firearm pointed at it? Beyond that, what if every school had sensors which automatically and continuously sent out “deactivate” commands to every nearby smart Slickgun, just as they showed me with the tablet at their booth? What if all of this was wrapped up in the “2021 Stop Violence Against Cops and Kids Act” or “2021 Special Technology to End Mass Murder Act” (STEMM Act) mandating that every firearm in the United States be equipped with such a system, and providing funds for police and schools to purchase the necessary technology and equipment? I don’t think it’s farfetched from either a technology standpoint or a legislative proposal standpoint. Radetec told me they could have both “smart Slickgun” concept systems fully functional in 3 to 6 months. That could mean 3 months, 6 years, or never. I’ve never heard of them before and don’t know if they have a track record of success. But I do know their proof of concept demo at SHOT appeared to function, and the second–and third-order consequences scare me. Naturally, to deter noncompliance, the proposed legislation would require stiff mandatory minimum sentences for those found in possession of non-compliant, non-smart guns. How about a mandatory ten years in federal prison for each noncompliant firearm? There would probably be some sort of tax credit scheme to offset the cost of modifying firearms and to mollify critics who would say the legislation is a burden on law-abiding Slickgun owners. President Kamala Harris, flanked by some big-city police chiefs and school administrators, would ask Americans if it were really an infringement on their Second Amendment rights to no longer be able to shoot cops and children. “No!” would cry the masses at the fourth annual March for Our Lives, demanding “common sense Slickgun safety laws.” Later that week, the legislation would fly through Congress to her desk, where it would be signed into law. I’m going to try to go to sleep. It’s not going to be easy. 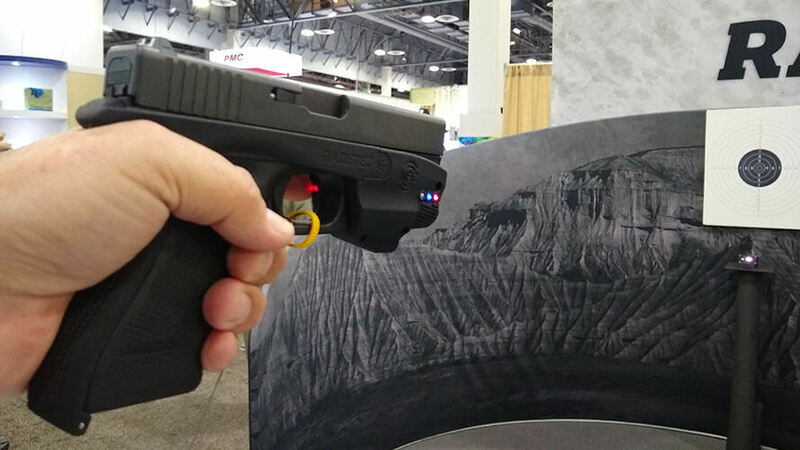 The post Smart Guns Are Coming and They Scare the Crap Out of Me appeared first on Omaha Outdoors.